Although most woodworking tools last a very long time, the blades for a traditional woodblock print carver's main knife wear down through use very quickly, and the (professional) carver is thus constantly purchasing new ones. Because of this pattern of frequent replacement, both myself and Tsunehisa Sato (the young carver who has been doing work for Mokuhankan) have been keenly aware of the current sad level of craftsmanship in this field. The blades we receive have been getting worse and worse over time, and in recent years the quality has dropped to a level where we find ourselves tossing out as many blades as we use. I myself had simply been accepting this as a 'can't be helped' type of situation, but Sato-san was more persistent in his search for something better, and eventually located a workshop run by a blacksmith who 1) is not willing to let his quality follow that same downward path, and 2) is willing to accept customer requests for different steel formulations for specific purposes. They are a very small outfit, and because their prices are higher than other shops - a direct reflection of the materials they use and the time they take to make each blade - they are not having an easy time of it these days. The workshop owner and Sato-san hit it off; the blacksmith was happy to have a (potential) customer who spoke the same 'language' and who understood the difference between good and bad blades (and who seemed willing to pay for it), and he made some samples, one of which Sato-san passed on to me for testing. I was very impressed. The blade took an extremely sharp edge, and yet was not prone to quick breaking, as most 'sharp' steels are. It was also possible to work for much longer before having to put it back on the sharpening stone. As to how this magic is performed, there is really no particular mystery. The appropriate levels of carbon to be added to iron to create any particular type of steel have been known for a long time; as are the myriad details of the process: what temperature for the steel, how long to hold it at that temperature, how hard to strike during forging, how quickly/slowly to cool it, and a thousand other factors through all of the subsequent steps of annealing, shaping and tempering. These things are not 'secret', and the raw knowledge of how to select exactly those methods that will result in a blade that has the desired characteristics, are known. Any competent craftsman 'could' do this. But these days, few do. All of the Mokuhankan knives and chisels are made with the same laminated techniques that have been in use in Japan for many centuries. The steel used at the cutting edge is a high-carbon type that allows for a very sharp edge to be formed, but this by itself would be too brittle, so it is bonded to a layer of softer steel for support. 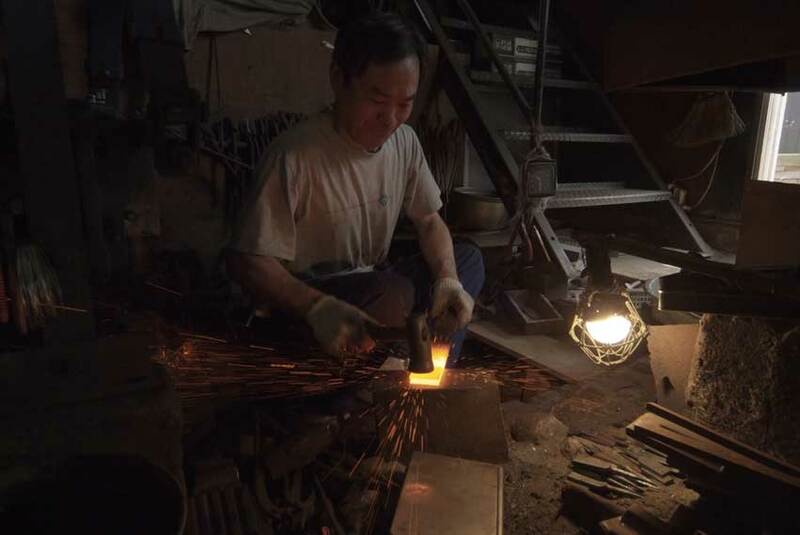 The blades are made in that small-scale family workshop (which is in western Tokyo), where the craftsmen (and a young woman apprentice) sit at an open hearth, heat the steels to the correct temperature, and hammer them together on an anvil. The metal is then re-heated and forged into the proper shape for each type of tool, following which it is annealed, ground and tempered as necessary. The only power tools used during the process are those used for grinding to shape; everything else - including all the forging - is done completely by hand. The blacksmith provides the blades to us in 'raw' form - bare pieces of steel, formed and sharpened to our specifications, but otherwise unusable. 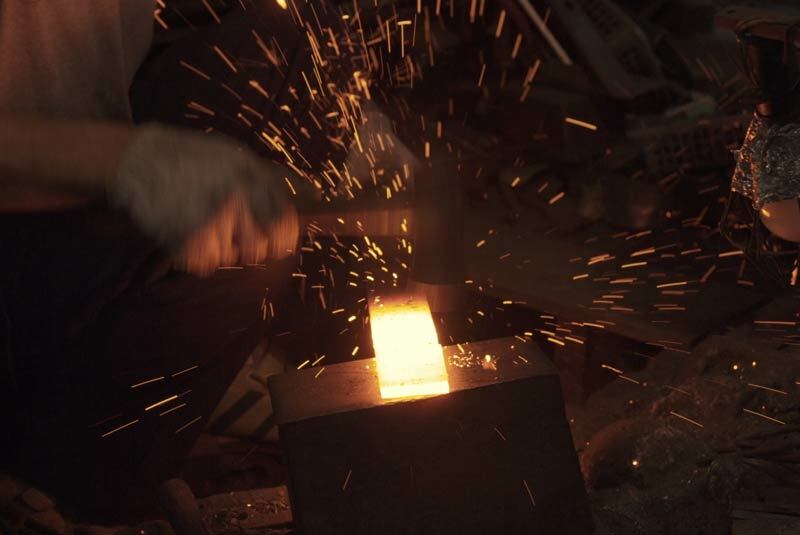 We have designed our own handles for them, based on the traditional patterns, and are making them - right here in our own building - with a level of quality that we hope matches that of the steel itself. We know that tools are 'utilitarian' objects, but we want them to be beautiful too. We use yama-zakura - mountain cherry - for the handles of all our smaller chisels. It is strong and beautiful, and we couldn't resist having the tool itself made from the same wood that is on the bench at the other end of the cutting action! And because we make the handles ourselves, we have total control over the process and are able to take things to somewhat ridiculous levels: all the tools in any given set are made with wood from the same plank, and even better ... each pair of tools - a 3mm and 6mm aisuki chisel pair, for example - are cut side-by-side from the same piece! There is no single best type of steel formulation for all printmakers. That sample blade I just described was formed with a very delicate edge, and if it were to be given to an inexperienced worker, it would probably break quite quickly. We have tried a number of different patterns, and have decided to offer tools in two categories, which we are calling General and Premium. Both types of course take a very fine edge, but the General tools are formed from a steel that is more resistant to breakage. They are 'harder', something you will notice on the sharpening stone, where it will take a few more strokes to get to the desired result. The Premium tools - somewhat more delicate - are best suited to a person who has had some experience, and who is doing generally finer work. The price difference between the two is primarily caused by the raw material cost - the Premium tools are made from a rarer and more expensive steel - as well as the larger amount of 'losses' occurred through the course of the manufacturing process. In this early stage of our tool-making venture, we are going to be offering only a limited range of items, and have decided to begin by producing a boxed set of six common carving tools of the General type. After we get our production working smoothly, and once we see something of the reaction from printmakers, we will expand the catalogue step by step. We intend to have all the tools available individually, as well as in sets, and of course in a complete range of sizes. A bit further down the road, it would be interesting to be able to offer them with handles in custom sizes to suit the user, and we are designing our production jigs with this in mind. There is no escaping it, we are basically tool 'geeks'. We love using these tools, we have thoroughly enjoyed designing them, and we enjoy just holding and looking at them. So of course we want them to be presented and packaged well! After having sample boxes made for us by various suppliers, we realized that - just as with the handles for the tools - there was only one way to guarantee that the work would be done to our satisfaction ... we have to make these ourselves too. Our sets of tools come in a paulownia wood box, which can be their permanent home if you wish. A small booklet is fitted into a pocket inside the case, containing information on the tools, their background, and their maintenance. Each box has a label pasted inside the lid, on which is printed the maker's information, the date of manufacture, the name of the person for whom this particular set was prepared, and a serial number. There is no particular maintenance necessary for these tools other than keeping them away from a damp environment that would promote rusting. If they are not to be used for an extended period, keeping the exposed metal areas lightly oiled would be a good idea. Sharpening is of course the major 'maintenance' necessary on such tools, and the booklet included with each set gives a basic overview of our recommended sharpening procedure. This is supplemented by a series of online videos on our website demonstrating the process in detail. We are also going to offer sharpening stones for those who cannot locate suitable waterstones locally (although with the recent global interest in Japanese woodworking tools of all types, these are now probably available in your area ...). So there you have it. We are very happy to have found this workshop, and are very excited about being able to take their blades and turn them into beautiful tools for woodblock printmakers all over the world. We are extremely proud of these tools, are now using them ourselves exclusively in our daily professional work, and hope that you will consider giving some of them a good home! Jan 15, 2012 : Another Big Step! Update: The tool project was rolling along pretty well, if slowly, until a kind of disaster hit - the gigantic 'Ukiyoe Heroes' project. This was not a disaster for Mokuhankan - it was a huge 'saviour' for our business - but it has pushed all other projects to the back of the bus. I am currently unable to give a date when these knives will be ready; it depends on how soon I am able to find a person to help me manage the project ... Thank you for your patience!